In the bowl of a stand mixer or using a hand-held mixer, whip the heavy cream until stiff peaks form. Using a rubber spatula, stir the sweetened condensed milk, peppermint extract, vanilla extract and food coloring into the whipped cream until it is green and there are no streaks. Fold in the chopped chocolate chips and pour the mixture into a freezer-safe container. Cover and freeze at least 5 hours or until frozen. To serve, allow the ice cream to sit out five minutes before scooping. 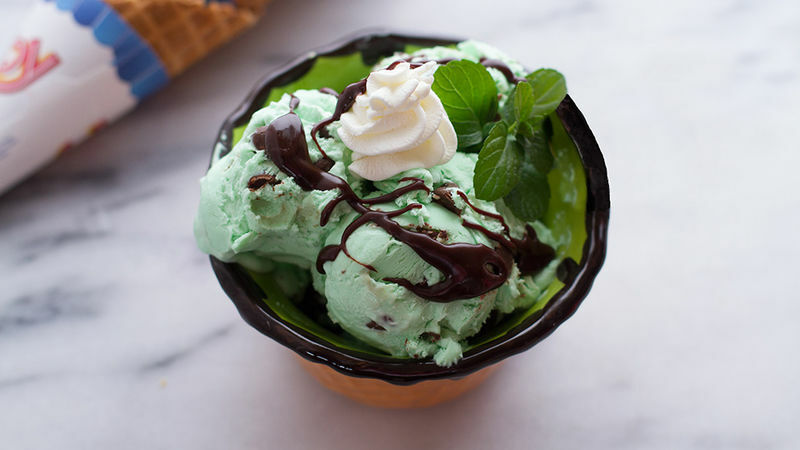 Scoop into bowls or ice cream cones and serve as desired with hot fudge sauce and a spring of fresh mint. I'm not sure there's a more refreshing or classic summer treat than mint chocolate chip ice cream. This is the perfect way to cool down in the summer! And get this, it is so easy. No really, it is. Ten minutes of prep and you're done! The hardest part is waiting for the ice to freeze. You only need 5 ingredients (well, 6 including the green food coloring). If you don't have food coloring, don’t worry about it. The ice cream will taste the same with or without it. Heavy cream, sweetened condensed milk, peppermint extract, vanilla extract and green food coloring. Switch to using a spatula and add the sweetened condensed milk, peppermint extract, vanilla extract and food coloring. Mix it all together until no streaks remain. Stir in the chocolate chips. I chopped mine since they were a little too big. Or, use mini chips if that's easier. Pour the ice cream into a freezer-safe container and freeze until solid. When ready to serve, allow the ice cream to sit out 5 minutes and then scoop and serve with some whipped cream and hot fudge sauce.